How about planning an awesome trip which can take care of all the aspects of your touring? Curiosity, devotion, worshipping, nature, adventure, mountains, trekking, culture, history, architecture and many more! If these are the things you crave for, Tirupati is the perfect destination for you. And if you love to enjoy the miracles of nature, ‘Silathoranam’ is the ‘must go’ package, which can give an exceptional feel of amazement throughout the journey. ‘Silathoranam’, the name itself implies ‘garland/festoon of rocks’. In Telugu, ‘Sila’ is rock and ‘Thoranam’ is a garland strung over a threshold. Silathoranam is a distinctive geological wonder which is located to 1 km north of Sri Venkateshwara Swami main shrine of temple-town Tirumala. Even though it looks like a small cluster of ancient rocks with a remarkable height, a natural unique formation of arch can be seen; an artistic masterpiece created by none other than Mother Nature herself. The place is also called ‘Sahaja Silathoranam’. Silathoranam was first found during excavations of a geological fault in Tirumala hills in 1980s. The arch formation of rocks is believed to be of several million years old by the geologists. The studies have confirmed that this rock arch wonder is older than that of Jurassic Period. 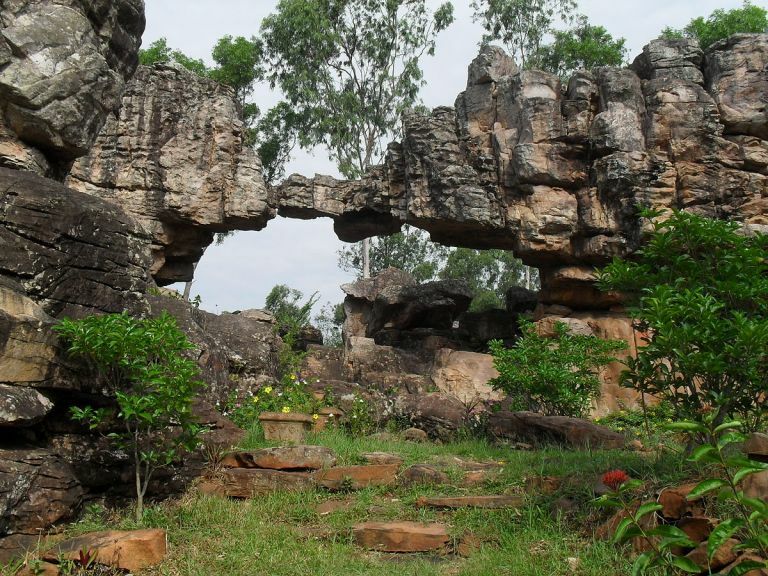 Surprisingly, it is also one of the three rare natural rock arch formations in the entire world. The other two in the list are Rainbow Arch Bridge of Utah in United States of America and Dalradian Quartzite of United Kingdom. The mysterious arch of rock measures about 8 m in width and 3 m in width. It looks like a set of two dissimilar rocks connected by a thin link of rock, forming an arch of rocks. Experts have also called it a unique formation of Pre-Cambrian period. Formation of this rare geological fault is attributed to corrosion, weathering, intensive climate changes accompanied by oceanic transgression and erosion of stream action, what the rocks had withstood from millions of years. No wonder Silathoranam is one of the most famous places out of many in Tirupati region, a paradise of tourism in itself. As far as the mythology is concerned, Silathoranam has many stories revolving around it, adding to the cultural richness of Tirupathi. Several pilgrims find it a very sacred one as the arch formation resembles to Lord Vishnu’s conch (Shankha) and discus (Chakra), highly regarded symbols of worship in Hinduism. Beliefs also extend to say that the rock structure is none other than Adishesha, a divine serpent of Lord Vishnu, as the arch resembles to serpent Adishesha’s hood. One similar account also describes a story that Lord Vishnu descended from Vaikuntha in search of his wife Shri Maha Lakshmi and entered the sacred land of Tirumala through this divine rock made arch. Surprisingly, the height of Lord Venkateshwara Swami’s statue placed inside the main shrine matches with that of Silathoranam rock arch. Naturally because of its unique beauty and as a wonder of nature, Silathoranam has been successfully able to attract several tourists across the world, apart from the curious geologists. Accordingly temple management named ‘Tirumala Tirupathi Devasthanam’ (TTD) has taken excellent measures considering the importance of tourism by promoting it systematically. The state Government has taken the responsibility of maintaining Silathoranam, declaring it as a ‘National Monument’, by collaborating with Archaeological Survey of India (ASI). By converting the place into a rocky garden, with full of colourful flowers, ample of benches to sit and tiny shops for snacks-art-crafts, the place can be witnessed with several local people and tourists enjoying their evenings. Caged birds successfully amuse the people irrespective their age and special fencing arrangements have been made to keep the ignorant tourists away, who have a great fancy for scribbling obscenity wherever they find a rock. Luckily in terms of tourism, Silathoranam is highly accessible. The distance between Silathoranam and main shrine is just 1 km, whereas the distance becomes 4 km if we start from Tirumala Bus Depot. One more tourist attraction named ‘Chakra Teertham’ is in a walkable distance. Generally tourists prefer to visit both the places together. One more unique tourist attraction near Silathoranam is ‘Shri Vari Pathulu’ (Shri Hari’s feet). As far as the mythological background is concerned, this is the first place where Lord Maha Vishnu set his foot on earth, when he came to Tirumala hill from Vaikuntha. Pilgrims pray and crave for salvation by worshipping the sacred footprints allegedly believed to be of Lord Maha Vishnu. Being located at the peak of Nayanadri hill (Nayanagiri), highest mountain of the divine Sheshachalam mountain series, this place is famous for its bird-view which is truly a ‘feast for the eyes’ for the tourists. As mentioned above, Silathoranam is well connected by road, rail and air. Tirupati Railway station is the nearest railway station for the travellers who prefer trains for their journeys. Renigunta Airport which is nearly 15 km away from Tirupathi keeps it connected by air. State Government has its own share of commuting service contribution in terms of Andhra Pradesh Road Transport Corporation (APRTC) buses. In addition, TTD is running special buses for all the pilgrims and tourists who want to visit Silathoranam from different corners of Tirupati. Private taxis and autos also operate well taking care of commuting demands of millions of tourists. And for those people who enjoy walking, the best choice is to walk from Sri Varaha Swami shrine, as Silathoranam can be covered in less than 20 minutes from here. Add Silathoranam in your itinerary of next Tirumala trip. Enjoy a sunset or a full moon light in the bosom of nature like countless other tourists and trekkers who visit Tirupati. We can bet on the fact that the charm of Silathoranam can leave you overwhelmed by its serene beauty. passion other than the profession.